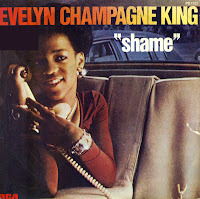 Evelyn 'Champagne' King was born on July 1, 1960. She released 'Shame', her only top 10 hit in America, in 1978. After a long struggle in the UK singles chart, 'Shame' eventually made the top 40, peaking at number 39. In the Netherlands, it did considerably better: peaking at number 18. The song was covered by Kim Wilde in 1996. This is how I became interested in the original version. I bought the single in 2000 after a long hunt.